At the start of season 2007/08 (actually after the second game), I launched a thread on AcciesWorld called Top of the League! 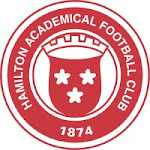 It was an exciting time to be following Accies, perhaps the most exciting time since I started following in the 1970s. We had survived near extinction, including relegation to the fourth tier, had built a new stadium, and were heading back to the top flight. 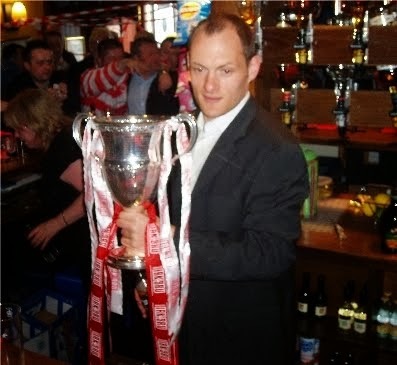 I was just one of many Accies fans who felt certain we were going to win the league in 2008. As indeed we did. This season has not been the same. Despite establishing an early lead, many of us never felt we were the best team in the league, or favourites to win it. The club's stated aim was to make the play-offs. Yesterday we returned to the top of the league. And we secured a minimum of a place in the play-offs. These are massive achievements, and every congratulation is due to the players, Alex Neil's management team, and Les Gray's board. But it's not over yet. With just five games left, we are in pole position to win the league. The first remaining hurdle faces us when Dundee visit NDP next Saturday. We have not yet managed to beat Dundee this season, but if we can at least draw, we will still be top and one step closer to the title. Can we do it? I have no idea. The fluctuating form of both Dundee and Accies suggests it's not just a question of avoiding defeat in the head-to-head then seeing out the season. I don't expect either contender to win all of their remaining four games. But undoubtedly the game this coming Saturday is the toughest of our run-in, and if we can actually win it, then we have a fantastic chance of winning the league and returning to the SPL. Perhaps this most successful period of our modern history is not yet over - the adventure continues.